Habit: Perennial herb, subshrub; roots generally in fleshy clusters. Stem: 1--several from root crown. Leaf: basal and cauline, alternate, large, deeply, generally ternately, dissected to compound, +- fleshy; stipules 0. Inflorescence: terminal, flowers 1 or few in cluster. Flower: sepals generally 5, free, leathery, persistent in fruit; petals generally 5--10; stamens many, maturing outward; pistils 2--5, simple, thick-walled, surrounded at base by lobed disk, style +- 0. Fruit: follicles, 2--5. Seed: large, generally several per follicle, generally black, arilled. Genera In Family: 1 genus: western United States, Eurasia, especially temperate eastern Asia. ; many cultivated. Note: Disk evidently not nectar-secreting. Stem: generally branched. Leaf: 1° divisions 3--9 cm, 1--6 cm wide; ultimate segments +- wide-linear or oblong, bases +- or not tapered. Flower: petals 15--25 mm; filaments 5--8 mm, anthers 3--7 mm. Fruit: 3--4 cm. Seed: +- 16 mm. Chromosomes: n=5. 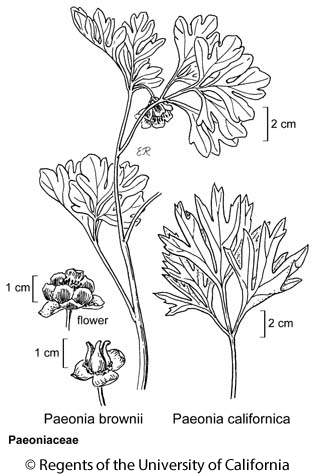 Citation for this treatment: Fosiée Tahbaz 2012, Paeonia californica, in Jepson Flora Project (eds.) Jepson eFlora, http://ucjeps.berkeley.edu/eflora/eflora_display.php?tid=35855, accessed on April 24, 2019.
s CCo, SCoR, SCo, TR, PR; Markers link to CCH specimen records. Yellow markers indicate records that may provide evidence for eFlora range revision or may have georeferencing or identification issues. Purple markers indicate specimens collected from a garden, greenhouse, or other non-wild location.